The HTC One is an excellent smartphone, one of only three phones to ever earn a five-star rating from us. Despite our unmitigated endorsement of the device, we're still curious about a of couple things. Like why did China and Japan get a version with microSD? 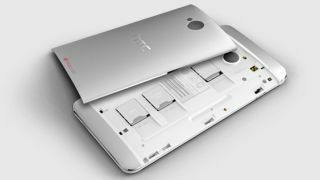 A lot of users would love to bolster the device's storage with an additional 64GB. At CTIA 2013 we had a chance to sit down with HTC and ask them just that. Senior Global Online Communications Manager Jeff Gordon - not the NASCAR driver - fielded our burning questions. "Because the Chinese version of the One is designed specifically for the smaller Chinese radio bands, we do have additional space inside the device we were able to use for the microSD slot. That space isn't available to us in the global version." We're assuming this is also the case with the Japanese version, which has a microSD as well. We're still green with envy, but at least there's an explanation. Gordon's reasoning would seem to be supported by an iFixit teardown, which found the One to be harder to repair than the iPhone 5. Given that the iPhone 5 was notoriously hard to assemble, there's probably not a lot of room in that thing.